I'm 33 weeks pregnant. This is the biggie for me. C was born at 33+2 so I think if I get past Wednesday I'll feel like I've accomplished something amazing! This week has, again, been tough. The baby's kicks are actually hurting and making me jump. I'm occasionally getting weird lower back cramps which is terrifying Chris because he keeps thinking I'm going into labour and heartburn just seems to be getting worse. Maybe she'll have lovely long hair! Under my right rib still aches and it's proving tough to bend over to change C's nappy. He doesn't make it any easier because he gets really excited and kicks his legs which means nappy changes take twice as long! This week the baby weighs around 2kg (the size of a honeydew melon) and will measure about 44cm. I already know that she is head down and ready to come into the world. I have found that my ankles seem to swell but it does go away again so I'm not too worried that the pre-eclampsia may be back. 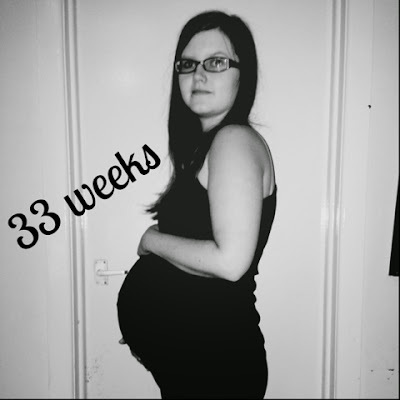 2 comments on "My Second Pregnancy: 33 Week Bump Update"